Previous to this past weekend, if I had been stuck with the word “Carnaval” during a round of Taboo, I would have been limited to the words Venetian masks, New Orleans beads and Brazil to describe this festival to my fellow players. 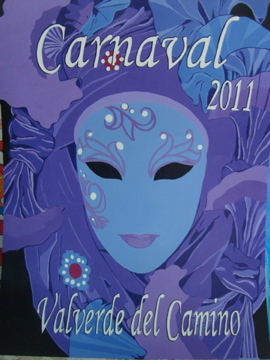 My concept of Carnaval was limited to its popular manifestations widely known in the U.S. Unbeknown to me, Carnaval is also celebrated in Spain. 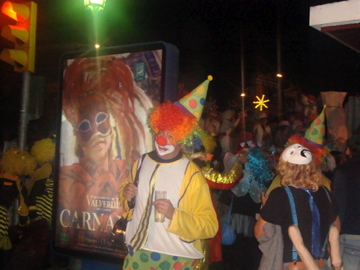 Certain cities are more famous for their Carnaval celebrations, and draw huge crowds, such as the Carnaval in Cádiz. Others are mostly local celebrations, like the one in Valverde del Camino, the tiny pueblo where Julia teaches. Julia and I had the opportunity to witness both of these distinct Carnavals during this past weekend and walked away with a bevy of new buzz words to describe Carnaval. Valverde’s celebrations kick off with a parade in the streets. Giant floats blaring music overflow with crowds of people. Julia and I estimate less than 3% of the people in the streets were NOT in costume. Pirate was a popular costume choice. 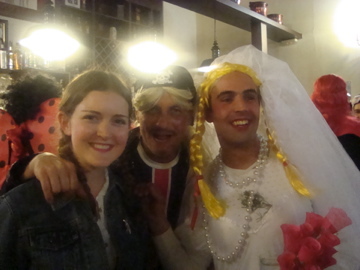 So was anything involving cross-dressing, such as the pictured male bride. Julia and I estimate about 1/3 of the men cross-dressed. Julia ran into some of her students and fellow teachers at the Carnaval! Middle Eastern costumes were also popular. In fact, we saw quite a few “Middle Eastern terrorists.” I thought it was interesting to see a costume that would be so taboo in the United States be completely accepted in a different cultural context. Valverde’s parade ended in the town’s old train station, which had been converted into a dance hall, complete with bar and live music! This group was one of our favorites they made these scuba diver costumes completely out of household materials! 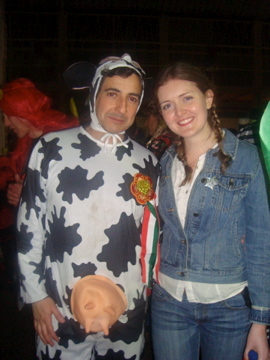 Found a cow to go with my cowgirl costume! 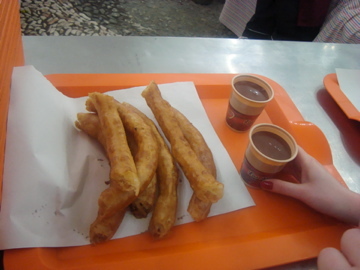 There was a large chocolate y churros tent outside of the old train station, providing all-night revelers with fuel. Julia and I left the station at 5:30am, and people were still dancing away! 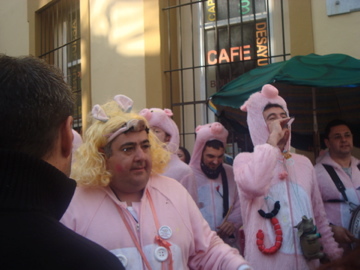 While Valverde’s Carnaval was attended almost exclusively by locals, Cádiz’s Carnaval has become so popular that it is a major tourist draw. 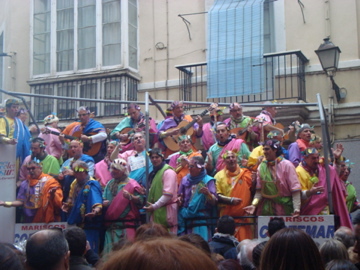 During the two weeks leading up to Cádiz’s Carnaval, costumed musical groups called chirigotas compete with sets of musical numbers. The competition is televised from Cádiz’s main theatre. Their songs are filled with political and cultural references, and Julia and I were assured that we would understand not one bit of their content. The official chirigotas participate in this televised competition, and then sing on stages and floats during the weekend of Carnaval. 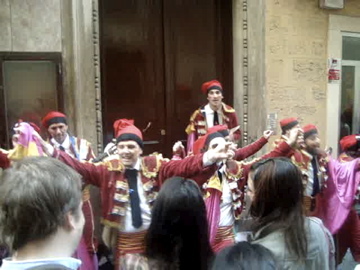 In addition, unofficial chirigotas roam the streets and attract crowds by spontaneously bursting into song. 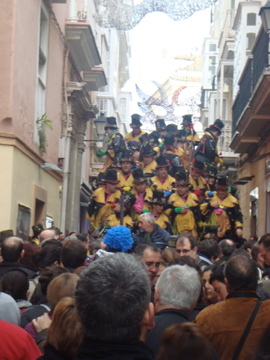 Many Spaniards consider the unofficial chirigotas a bigger draw than the official ones. 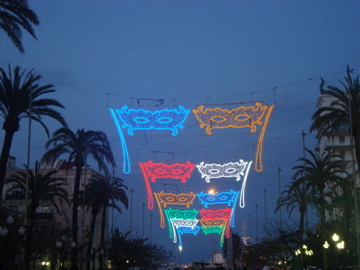 Julia and I went to Cádiz during the day on Sunday, which is considered to be the actual Carnaval. After the sun goes down, the city dissolves into botellón, or one large drinking party. An official chirigota on a float. Another chirigota float. Though both these chirigotas were all-men groups, there were also co-ed, all-women, and junior chirigotas. An unofficial chirigota, all in piggie suits. At one point, they were holding up a cured ham leg and had the crowd chanting “jamón! jamón! jamón!” (“ham! ham! ham!”). Another unofficial chirigota. They called themselves the sad bullfighters from Cataluña, a northern Spain province where bull-fighting has been banned. 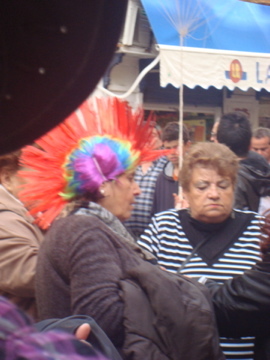 Julia and I loved that the Cádiz Carnaval crowd included families (despite the extremely racy content of the unofficial chirigota’s songs and the abundant drinking in the streets- as in people with shot glasses tied around their necks with coolers of drinks in tow) and people over the age of 65, like this lady in the Technicolor wig. As the sun went down on Sunday, the streets were bathed in light with lights like these all over the city! The week after Carnaval in Valverde, the place become a ghost town as everybody abandons the city for their country homes. It is customary for families and friends to travel from country home to country home, drinking and eating the week away. I imagine in Cádiz, the largest cleaning crews known to man must take over the city streets to clean up the confetti, silly string and remnants of the night’s revelries from yet another year’s Carnaval. I’ve indulged in similar rituals today by barely budging from bed and cleaning up the remnants of a room ripped apart by last-minute packing. 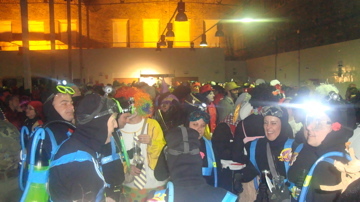 The Carnavals were unique from anything I had ever experienced! If your travels in Europe ever coincide with the days of Carnaval, consider making the trip to Spain because it is very much worth seeing! 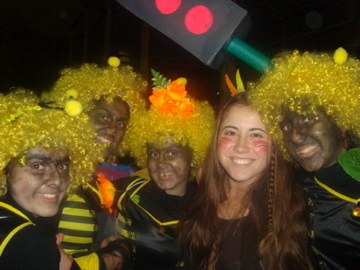 I did not know until now that Spain had Carnaval celebrations!!! !